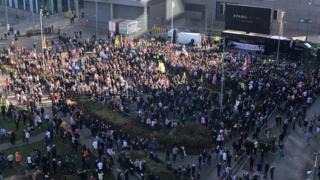 About 3,000 people have joined former English Defence League leader Tommy Robinson in a protest against the BBC. The corporation confirmed an upcoming Panorama episode was investigating Mr Robinson, whose real name is Stephen Yaxley-Lennon. He criticised the programme ahead of the rally outside the BBC’s Salford offices. About 500 people have attended a counter-protest by anti-fascists. The BBC said the episode would follow its “strict editorial guidelines”. Mr Yaxley-Lennon said the aim of the protest was to make a stand “against the corrupt media” and called for the BBC licence fee to scrapped. The National Union of Journalists (NUJ) said they “roundly condemn Tommy Robinson… and his fellow, far-right thugs who intend to intimidate staff at the corporation, particularly those working on Panorama”. “BBC staff should be free to do their jobs without these threats,” the NUJ spokesperson added. In May 2018, Mr Yaxley-Lennon was jailed for potentially prejudicing two court cases – in Canterbury and Leeds – after having been found to have broken contempt of court laws by live-streaming outside them on social media. The Court of Appeal later quashed the Leeds conviction and ordered that it be reheard in its entirety. Mr Yaxley-Lennon is waiting for a decision from the attorney general on whether he will face a full trial for the alleged contempt outside Leeds Crown Court – the ruling that he committed contempt of court by live-streaming in Canterbury still stands. In November, PayPal announced it would no longer process payments for Mr Yaxley-Lennon, saying he had broken its policy on acceptable use. He was banned from Twitter in March 2018. It is understood that his account was suspended for breaking its “hateful conduct policy”.